Manger’s unique approach to driver design yields a monitor with exceptional time-domain performance — but it comes at a cost. Here at Sound On Sound, along with reviewing products from many of the usual suspects in the world of monitors, we also occasionally like to cover some of the more obscure options out there. And here, as a perfect example of the latter, is the Manger C1. Manger [to rhyme with ‘anger’, not ‘danger’ — Ed.] are a long-established German speaker brand whose products have in the past been aimed primarily at the very high-end hi-fi sector. 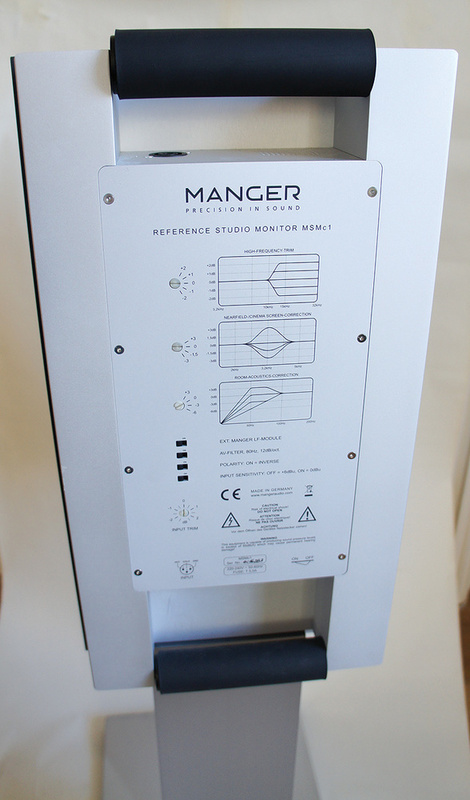 However, Manger describe the C1 as an “active studio monitor” and it certainly appears to tick all the boxes that could suit it to the role. A factor that makes the C1 rather more interesting than perhaps it otherwise would be is its use of the unique Manger ‘full-range’ driver. I’ll attempt a description of the Manger driver shortly, but first, just in case you were already becoming intrigued, you probably need to know right from the off that the Manger C1 is far from being an inexpensive entry-level monitoring option. It’s really quite expensive. The C1 is also apparently not an easy monitor to love for its looks. Pretty much everybody who saw the review pair described them as anything from odd to ugly. Their dark, battle-ship grey probably didn’t help, and although some of the colour options illustrated on the Manger web site would probably help lift the mood, whatever their colour, the C1 will probably always dominate a space visually. Having said all that though, and in contrast to various friends and family, I actually found C1’s ‘brutalist’ aesthetic not entirely unattractive. Their exceptional build quality and bomb-proof engineering pressed all the right buttons for me too. So, to that Manger driver: in principle, and as I’ve illustrated in Diagram 1 (below), even though it incorporates a relatively conventional voice coil, the driver perhaps has more in common with various other species of flat-panel radiator (electrostatic or Distributed Mode and Balanced Mode radiators especially; see https://en.wikipedia.org/wiki/Distributed_mode_loudspeaker) than it has with traditional conical-diaphragm moving-coil drivers. In essence it comprises a flat plastic multi-layer diaphragm directly driven by the circular voice coil at a location of around one third the diaphragm diameter. When the voice coil moves in response to the input audio signal it sets up bending waves in the diaphragm, and these propagate across the surface area and radiate acoustic energy in the process. The diaphragm is engineered, through its sandwich construction, to be more rigid towards the outside, and this results in a bending-wave frequency distribution of higher frequencies radiated from the centre and lower frequencies radiated from further out. This is in principle a neat solution to one of the fundamental problems of diaphragm transducers: how to engineer a diaphragm that’s large enough to be able to generate adequate acoustic power at lower frequencies, yet isn’t massively directional at higher frequencies. However, ‘in principle’ is rarely the same as ‘in practice’, and the fact that Manger have been developing and improving their driver for a number of decades now suggests that there are some real-world issues that require fixing. Diagram 1: Simplified Manger driver construction. Imagine dropping a pebble into a circular pool. The resulting wave (suitably analogous to a bending wave in a Manger diaphragm) will travel outwards towards the edge of the pool and, when it reaches the edge, reflect back towards the centre. If the size of the pool and the distance between wave peaks is mathematically related, constructive and destructive interference between outgoing and returning waves will occur. If you were to measure the ‘frequency distribution’ of waves in a pool (no, I’ve no idea how you’d do that either, but stay with me) it would display peaks and troughs at specific frequencies. Of course, we don’t need a circular pool and a supply of pebbles to appreciate this ‘standing wave’ phenomenon. Most of us live with a studio space that demonstrates an analogous effect to some extent perfectly well. Play a long bass note with a wavelength that is exactly divisible into one of the room dimensions and you’ll likely get a standing wave. Manger’s technique for managing the standing wave phenomenon in the driver diaphragm is to attach a specifically shaped foam damping layer on the front and back surfaces of the diaphragm. This is the star-shaped component visible in the photographs. The star shape of the damping layer selectively dissipates the wave energy at specific frequencies so standing waves are not set up. I’ll return to describe the performance of the Manger driver in a few paragraphs time, but before that, back to a little more about the C1 generally. The C1 is not just a potentially expensive monitoring option, it’s also a large and heavy one. In terms of physical size, it might just about constitute a viable nearfield monitoring option for those lucky enough to be blessed with generous studio space, but thanks to its not inconsiderable 30kg weight, any wall-mounting arrangement would probably require the services of a structural engineer. The combination of size and weight certainly looked too much even for my uber wall brackets, and I certainly didn’t fancy making the phone call to the distributor to explain that his expensive monitors just fell off the wall, so I didn’t risk it. Instead I used the C1s in my alternative monitoring position out in the studio room mounted on their matching stands. The C1 stands are heavily constructed in steel plate and aluminium extrusion and attach to the monitors through a simple tongue and slot arrangement. It’s neat but it’s very much a two-person job — you really wouldn’t want to miss the slot and drop 30kg on your foot. The standard C1 stands are designed to mount the monitors roughly at ear height for a comfortably seated (OK, relaxed on the sofa) listener, however, custom-height stands are available so a taller version could be used to position a pair of C1s behind and just above a workstation or mixing desk. Even though I wrote earlier that the Manger driver is a full-range device, and in some smaller Manger products it is used to cover the full audio bandwidth, in the C1 it is used only from 330Hz upwards. The lower-mid and bass band is covered by a conventional 200mm moving-coil driver. The 200mm driver is hidden behind a fabric grille so it’s not possible to say much about its design or apparent quality. The C1 specification describes it simply as a polyester/glass-fibre-sandwich cone driver with a 38mm voice coil, loaded by a closed box. The specification also claims low-frequency bandwidth down to 30Hz, however the close-mic measurement I took using FuzzMeasure, illustrated in Diagram 2, shows in reality that the response is actually over 10dB down at 30Hz. Diagram 2: Low-frequency response (10Hz - 200Hz). Diagram 2 also shows that, despite the C1’s closed-box design, its LF roll-off rate is somewhat steeper than the natural 12dB/octave slope that would be expected. This suggests that there’s an additional 6dB/octave high-pass filter in the electronics to offer some sub-sonic protection for the LF driver. A significant contributor to the weight (and cost) of the C1 comes, I suspect, from its amplification. In comparison to the near-microscopic size of some contemporary Class-D amplification, the C1’s conventional Class-A/B electronics, mounted as usual on the rear panel, look as if they might double as a medium-sized power station able to run a small town. The amplifiers, of course, don’t quite achieve power-station levels of output, however their specified 250 and 180 Watts into 8Ω (LF driver and MF/HF driver respectively) is very far from miserly, so the C1 is clearly not short of muscle. It’s also not short of rear-panel input sensitivity and EQ options. Input sensitivity can be adjusted across ±6dB, with further trim options covering ±2.5dB, and the EQ options provide LF, MF and HF switched adjustment at 100Hz, 3.25kHz and 10kHz respectively. There’s also a polarity switch and an 80Hz LF filter for 5.1 monitoring. Input connections on the C1 are limited to a single balanced XLR, and the monitor is entirely analogue throughout. Located on the upper edge of the amplifier module is an XLR socket intended for the connection of an optional C1 bass module that adds another 6dB of low-frequency headroom to the system. I’ve never done any acoustic measurements on a Manger driver before, so I had no real idea of what to expect once I put up a measuring microphone at a 0.5m distance on its central axis and pressed the FuzzMeasure ‘go’ button. Diagram 3: The 300Hz - 20kHz response: on-axis (blue trace), 15-degree horizontal off-axis (orange) and 30-degree horizontal off-axis (green). Diagram 3 illustrates the resulting on-axis, and 15- and 30-degree off-axis responses of the driver from 300Hz to 20kHz. There’s no avoiding the conclusion that things don’t look that great. Not only is the on-axis curve characterised by some significant lumps and bumps, the off-axis curves show that, despite the efforts to manage the driver’s dispersion by varying the mechanical characteristics of the diaphragm across its diameter, it is decidedly directional, with narrow and significantly lobed high-frequency radiation. So you might perhaps imagine I’d reluctantly offer a resigned shrug and pack the C1s away... But there’s another side to the Manger driver’s performance, one in which it excels, and that is in the time domain. To illustrate this, Diagrams 4 and 5 show the driver’s step response and waterfall plot measured using FuzzMeasure. The step response, Diagram 4, reveals a driver that combines a very fast rise time with a relative lack of overhang and resonant ringing (the ‘lumpy’ tail of the step response curve is the signature of the LF driver). Diagram 5 — the waterfall plot, illustrating how quickly a driver stops radiating a wide-band signal — displays a similarly unusual characteristic. Waterfall plots of conventional moving-coil drivers often show distinct resonant features that take a while to die down. The Manger driver, however, shows only a fast decay with no persistent resonant features. These time-domain characteristics are ones that would normally be more associated with electrostatic radiators rather than moving-coil drivers, and constitute the main thrust of Manger’s argument for their driver. The Manger driver achieves its time-domain performance thanks to a mechanical configuration that’s fundamentally different to conventional moving-coil drivers. When the voice coil moves in a conventional driver it does so with the aim of shifting the entire diaphragm backwards and forwards. Diaphragms are fundamentally massive, however, and have significant inertia, so they are reluctant to move, or to stop once on the march. When the voice coil moves in the Manger driver, however, it doesn’t so much shift the diaphragm but cause it to vibrate laterally. This means there’s far less mass and inertia involved, so the radiation of acoustic power can be made to stop and start much more rapidly. So, while the Manger driver appears to have some shortcomings in its frequency-domain performance, its time-domain performance is unusually good. The big question, though, is what that means for its suitability as a monitor. To begin with, the C1’s overall balance tends towards slightly warm. It’s not an ‘in your face’ kind of monitor and, in my room, a slight lift to the high and mid frequencies from the rear panel EQ did wonders for livening up the overall feel. Listening in the nearfield, however, there is no avoiding the C1’s narrow high-frequency dispersion. It was immediately apparent that the C1 has a relatively pronounced sweet spot. Move away from a central position while you’re listening close to the speakers, and the tonal balance loses some clarity and detail. Move further and the effect is more significant. However, if you listen further away from the C1, more towards the midfield, the phenomenon is much less pronounced. This is partly due to geometry, but also due to room acoustics, so if a pair of C1s were to be employed in more of a midfield monitoring role, their HF dispersion might well not be an issue. And actually, the C1’s size and weight is, I think, likely to push it more towards the midfield role anyway. The C1 is powered by traditional Class-A/B amplifiers, which output 250W and 180W to the low and high/mid driver, respectively.Leaving the C1’s high-frequency dispersion aside for a moment, in other respects it presents high frequencies with a remarkably natural and unforced quality. There’s no sense of listening to a tweeter that’s endlessly trying to keep up with the twists and turns of the audio signal. This phenomenon of unruffled clarity reaches down into the mid-range too, and while it might be stretching things to ascribe what I can best describe as a sense of coherence to the fact that one driver covers six octaves, I can’t think of a better explanation. The C1 doesn’t change much with volume level either: its character is consistent whether loud or quiet, and it does a great job of revealing the low-level detail and structure of a mix without, for want of a better word, ‘shouting’. It’s not all entirely good news throughout the mid-range however, as, along with its coherence and clarity, there seemed a mild nasal character to voices and acoustic instruments. The C1’s clean waterfall plot suggests that there’s no resonant issues that could be responsible, so perhaps the coloration is simply a result of the lumps and bumps in the speaker’s frequency response. It is, however, a character that could be learned and accommodated, and the C1 certainly wouldn’t be the first monitor to display a little mid-range coloration. So as with the HF dispersion, it’s probably not a deal breaker in terms of using the C1 for monitoring duties. The C1’s mid- and high-frequency character is reflected in its stereo imaging abilities. As long as you’re listening in the sweet spot, the imaging is really well focused with good resolution of depth and reverb effects. I’ve read a couple of reviews of other Manger-equipped speakers that have criticised the driver for its stereo image and depth portrayal, but I didn’t find it a problem at all. In fact, as with the general sense of coherence in mid and high frequencies, the Manger imaged well over the entire audio band and not just at selective frequency regions, as is sometimes the case with conventional speakers. But above its combination of coherence, imaging and idiosyncrasy, the most successful element of the Manger C1, to my mind, is its low-frequency performance. There really is nothing quite like a big closed-box speaker driven by a powerful amplifier, and whatever the C1’s idiosyncrasies elsewhere, its bass performance is, I think, exactly what’s needed in a monitor. It is well extended in terms of bandwidth, has no sense of overhang or pitch inaccuracy and, as with the C1’s mid and HF performance, doesn’t change much in character with level changes. The crossover from the LF driver to the Manger driver — helped, I suspect, by its relatively low frequency, enabling shallow filter slopes (because at 330Hz the wavelength is long compared to the distance between the drivers) — is well handled too, so the quality of the bass performance integrates seamlessly with the coherence of mid and HF. It’s traditional, of course, to end a monitor review with a conclusion, but the C1 is a tough one to sum up. Here’s what I think: I personally probably wouldn’t go for the C1 as a nearfield monitor. It’s expensive, big, heavy, tonally a little idiosyncratic, and its HF dispersion is just on the wrong side of liveable-with when listening very close. However, if I had the space in my studio to use the C1 in a midfield role, and the budget to afford it in the first place, and I was happy that I could accept some slight tonal idiosyncrasies, the C1’s sense of coherence, its unforced clarity, and its genuinely great LF performance could very possibly seduce me. No speaker is perfect, and just because the C1 is imperfect in slightly unusual ways, it shouldn’t be discounted. It very much deserves to be heard. While writing and researching this review I read the sad news that Josef W. Manger, inventor of the Manger driver and tireless evangelist for it (and for music more generally) passed away on the 27th October. He was 87. Manger, the company, continues under the guidance and great experience of Manger’s daughter Daniela. The C1 is unique, so if you like what it does, there are no alternatives. However, if your budget stretches to the C1, monitors from the likes of Dynaudio, Genelec, Kii, Barefoot, ATC, PMC, Geithain and quite a few others would also justifiably fight for your attention. Great sense of clarity and coherence founded on exceptional time-domain performance. Build and manufacturing quality is impeccable. Tonal idiosyncrasies and narrow HF dispersion. Despite its idiosyncrasies the C1 is in many ways a success. It is a seriously high-quality speaker founded on fascinating, one-of-a-kind technology, and offers a unique take on monitoring. £9500 per pair including VAT.